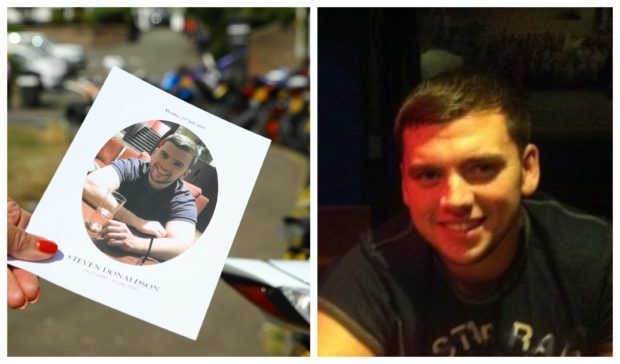 Murder accused Callum Davidson was seen riding his bike at a “leisurely pace” in Kirriemuir town centre less than three hours before Steven Donaldson’s beaten and burned body was found at a nature reserve near the town, High Court jurors have heard. A police CCTV expert said a camera picked up Davidson travelling along Reform Street two minutes before 2am on June 7 last year. PC David Budd, who was the CCTV co-ordinator in the Donaldson inquiry, also told the trial he believes two of the accused were seen on camera in a car having a “debate” over which route to take to Kirriemuir Hill on the night of the alleged killing. Under questioning by Crown prosecutor, advocate depute Ashley Edwards, Mr Budd was asked how Davidson looked on the mountain bike. “It’s a leisurely pace I’d say,” he replied. On the tenth day of evidence, the court also heard accused Tasmin Glass and Callum Davidson were captured at 11pm in Glass’s Vauxhall Corsa, coming up to a junction close to Davidson’s home. Mr Budd said arm movements in the car led him to the view that the pair were deciding which way to turn at the Elm Street junction with Kirrie’s Brechin Road. They have already been presented with a joint minute of agreement detailing movements of Glass’s orange Corsa and deceased Mr Donaldson’s white BMW 1 Series on various streets in Kirriemuir on the evening of June 6 last year. The car turned left at the junction and was then picked up in other Kirriemuir streets, including by a camera close to Glass’s home heading in the direction of Kirrie Hill. The court was then played a 00.36 hours CCTV clip from a private property in the vicinity of Tannage Brae.